There are some comic book creators that have been around for a long time and they make the industry look easy. No one epitomizes that more than Phil Jimenez. The veteran writer and artist flexes his muscles on DC Comics' new "Rebirth" title 'Superwoman' #1 and shows the youngins how launching a new series is done. Packed with action, exposition, background, storylines, surprises, and adventure, 'Superwoman' has everything a fan could want in a book. In fact, you'll feel like you've read two issues with how dense this first issue is. Jimenez not only envelopes readers with his writing but he also meticulously draws a world, where every tire tread on a tractor is accounted for and every ripple in the water. This is major league comic book magic-making at its finest as Jimenez brings Lois Lane and Lana Lang to the forefront in an impressive debut. As told through Lana's narration, 'Superwoman' takes a fast-paced sweeping look into life post-death of Superman. 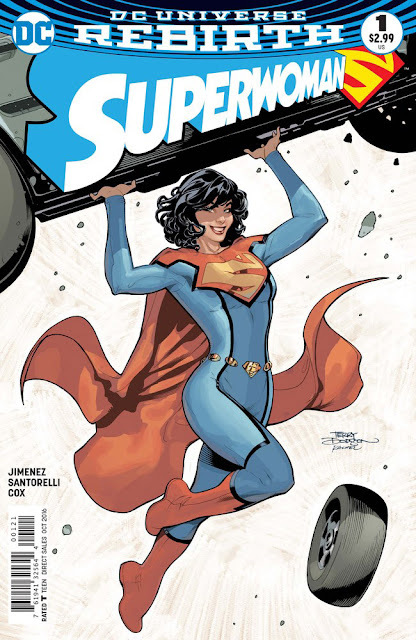 Super-powered Lois Lane (the New 52 version, not the other one married to Supes in Action and Superman) seeks help with her new-found powers from Lana who helped Clark with his. It was so refreshing to see the camaraderie and banter between them, bonded by their mutual relationships to Superman, but with their own agency and heroics. acquired flight, super-strength, super-speed, super-hearing, x-ray vision, and heat vision. She dons the classic look of Superman with the blue suit (no red undies on the outside though), red cape, and "S" on the chest. In comics past, Lois hasn't been Superwoman since the mid-1940s) and only briefly had psychic powers during the New 52. During training Lana notices that Lois is getting nose bleeds when she uses her powers and it might be a disconcerting sign of harmful side-effects. Lana probably knows first hand because not only was she the second person struck by the bolt of energy from Superman's death she is also a superpowered Superwoman herself. Lana, much like Superman-Red, sparks with electricity and made of red and white energy. She can fly too and manipulate energy. She's still learning what she's capable of, but knows how affect anything that responds to electrical fields. In this new reality of dual Lois Lanes and another Superman, it would make sense there'd be a Bizarro double. And this female Bizarro double could be Lois' executioner if the last page is to be believed. I venture to say it's a fake-out but what a cliffhanger after the very first issue. I haven't even covered Metropolis’ 375th anniversary celebration, a brief look at Daily Planet's rival Daily Star, Lex Luthor in his Super-armor and his enormous aircraft carrier designed to protect the city. It's a lot to take in but thankfully Jimenez has talented artists assisting him with the incredible visuals. Inker Matt Santorelli and colorist Jeromy Cox enrich the panels with great depth, adding emotion, energy and warmth. Jimenez brings a lot to each page. 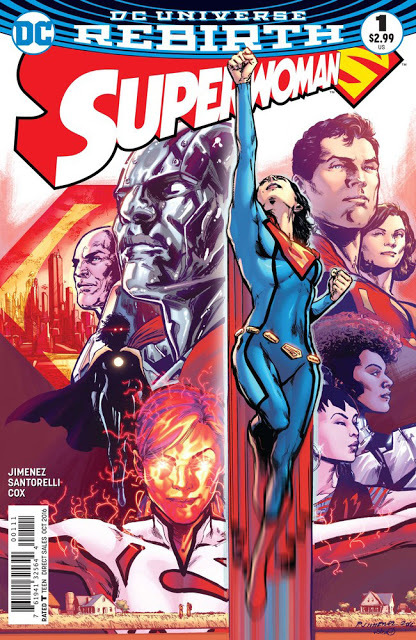 There's plenty coming at the reader, whether it's a dramatic team-building exercise for the Superwomen, a character-driven moment, a new plot development, or just a wink at the original 'Superman' movie, Jimenez is in full control of this fun and entertainment journey, reminding us what makes superhero books so great. Jimenez, Santorelli, and Cox have set the bar high after this debut issue. They've made 'Superwoman' #1 worth the buy at twice the price and I don't say that lightly. It has great action, chemistry and optimism between Lana and Lois, a shocking cliffhanger, and a sense of awe-inspiring superhero magic. Jimenez is Big Papi clobbering a grand slam 600 feet into the air with this issue. Don't miss it.